AMERICA/MEXICO - Migrant caravans, "men of faith on their way towards a better future"
Mexico City (Agenzia Fides) - "The Church in Mexico is very involved and follows with concern the events of migrant caravans, from the place of origin to that of destination, showing solidarity and hospitality throughout our national territory, from Tapachula to Tijuana", says to Agenzia Fides Father Arturo Montelongo, secretary of the Mobility Commission in the Episcopal Conference of Mexico (CEM). The phenomenon of Central American migrant caravans to the United States, in fact, continues. 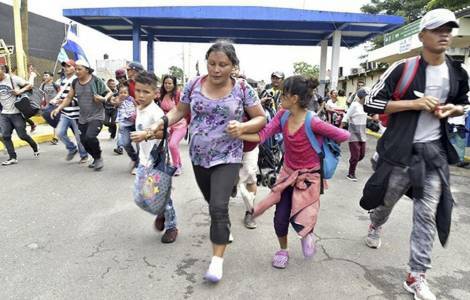 A large caravan began in October 2018 with the Hondurans who, exasperated by poverty and violence in their country, wanted to reach Mexico to seek asylum. Thousands more, on October 21, left Guatemala. Following three other caravans, made up of Salvadorians, tleft their country, while on January 14, 2019 thousands of Hondurans left San Pedro Sula. Fr. Montelongo emphasizes the lack of "responsible leaders who guide them safely and without deception, that speak to them sincerely and do not leave them adrift". The priest says he is surprised by the faith present among the men of these caravans: "They bring with them the enthusiasm of a better life, they are aware of the great difficulties they face and despite being of different Christian denominations, they know that without the help of God, it would be even more difficult to move forward". "Children, whole families, young people who thought they had a great future in their countries of origin, found themselves a very different reality", explains Fr. Arturo. At the same time, the secretary emphasizes the great participation of citizens and the favorable response of all to the humanitarian crisis. "Many synergies have been created with the various governments, at a state and municipal level, as well as openings at a federal level". Returning from the "Tex-Mex" meeting, which saw the meeting of the Bishops on the Mexican border with those of the American state of Texas, in El Paso, Fr. Arturo said he also witnessed the demonstration by Bishop Raúl Vera and Father Pedro Pantoja against the government of the state of Coahuila, which rejected the migrants by sending the last caravans to Nuevo Laredo and Monterrey. The Secretary points out the need for "public policies which are attentive to the human rights of their fellow citizens" in the countries of transit and destination. And recalls that "Pope Francis urges us to welcome, protect, promote and integrate, in order to transform world society and define once and for all that migration is a right and that migrants are not a danger, but an opportunity to development". "The Church in the United States is also working to support the cause of migrants", notes Fr. Montelongo. "Mgr. Mark Saitz, Bishop of El Paso – he recalls - has made available the structures of the minor seminary in order to open a shelter where migrants awaiting the resolution of their position, may have food, shelter and medical care".